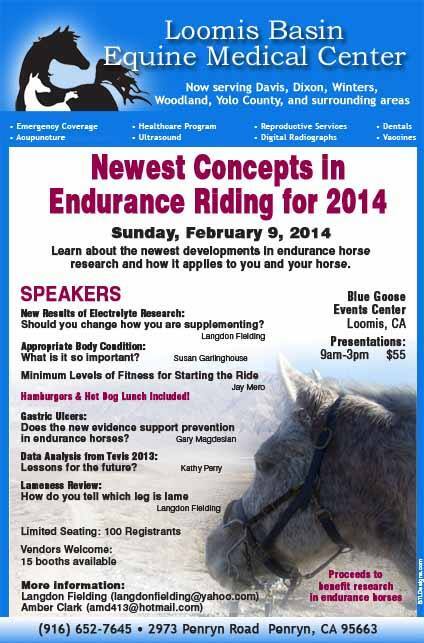 On February 9 2014 in Penryn, California, Loomis Basin Equine Medical Center will present an endurance clinic: "Newest Concepts in Endurance Riding for 2014." Attendees will learn about the newest developments in endurance horse research and how it applies to you and your horse. Speakers include Langdon Fielding, who will speak on new results of electrolyte research (Should you change how you are supplementing? ), and on lameness (How do you tell which leg is lame? ); Susan Garlinghouse, who will address appropriate body condition (Why is it so important? ); Jay Mero, who will speak on minimum levels of fitness for starting the ride; Gary Magdesian, who will address gastric ulcers; and Kathy Perry, who will provide data analysis from Tevis 2013. Seating is limited to 100 registrants. Presentations run from 9 AM to 3 PM for a fee of $55. Proceeds will benefit endurance horse research. For more information, contact Langdon Fielding at langdonfielding@yahoo.com, or Amber Clark at amd413@hotmail.com.